One of the subjects that we want to address this year, and probably even more in the years to come, is the shortage of women in computer science. There are 3 female speakers at GeeCON this year, there were 15 female participants at GeeCON 2011 in Cracow and we really do not think this is enough. It is not that women are incapable of programming or engineering in general. Did you know that ENIAC was almost entirely programmed by women? Remember Ada Lovelace? There were plenty of women in the early days of computing, and then... something happened. Girls are often discouraged from dealing with computer science or even mathematics. I remember a spatial geometry class from secondary school where the teacher (a woman!) said: "well, in my experience, girls usually have problems with it". I launched a little tirade to a girl sitting at the same desk. It is not really important here that 10 minutes later the same friend had to explain to me which lines are supposed to be sticking out from the page... The thing is, how many times do you have to hear something like that to give up and not even try to check your possibilities? 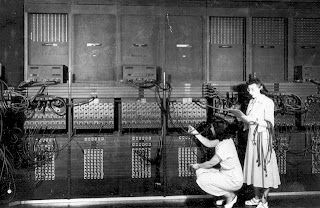 Two women operating the ENIAC's main control panel. On average, less than 30% of computer science graduates are women (this ratio is better in some countries that applied country-level measures to change it). I did a quick count in my yearbook: 14 out of 48, but it seems that there are fewer in the technical university. Somehow it got worse later: my team at work are 17 people, 2 of which are girls. And, by the way, I have plenty of workplace stories to tell. I’ve heard in real life, first person, that girls' job in IT departments should come down to picking UI colors, or that girls are quasi-programmers in general. Somehow those opinions, though presented to me, were never based on the job I have done. This post is not here to analyse the deep reasons of that, or to instigate the war of sexes. Instead, it is to say that we care! There are many reasons why women should be included more. First of all, it is beneficial for women themselves: IT jobs are often paid nicely, and it is important that the technology world, which in some cases starts dominating over the so-called real life, is not entirely created by men. Secondly, the market needs a lot of experienced programmers, and the talents of half the society often go to waste due to the early "programming" of brains. Another issue, a bit tricky to pronounce, is that often (but not always) women have slightly more advanced social skills, and people with social skills are an important factor of keeping a team together, on the same side. Finally, isn't it simply nicer to meet people of both sexes at work? Or meet nice girls at a programmers conference? The giants are trying to do something about it. There is the Google Anita Borg Memorial Scholarship, the Association for Computing Machinery has an ACM-Women committee... And if the giants can, we can try too, at least. As the first step, you can expect a new contest to be posted here very shortly, directed to women who would like to participate in the conference. I, from my side, am going to post here some women-in-IT-related stuff. The first project, documented in parallel on my personal weblog, is to talk to women professionals about their experience in IT. Do not fear, this subject will be present here but it is not going to dominate the site completely. There are many more subjects, and much more authors. Though there may be scarcity of women in the computer industry, but this number is increasing the women nowadays are involving there selves to learn more about new technology. Famous women in business are making ways for other girls to compete with men so to speak.